Reception for the Artist, Thursday, January 22, 7 - 9 p.m. 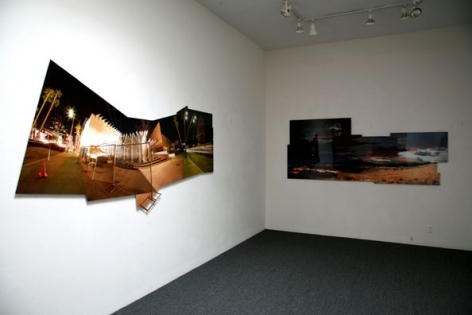 The Fahey/Klein Gallery is pleased to present a selection of images from the series of 360º architectural landscapes by Jeremy Kidd. 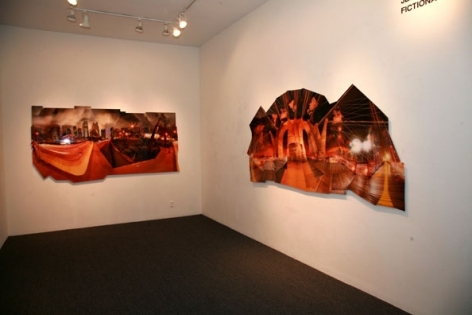 Fictional Realities combines a series of digital, time-lapse photographs that have been stitched and blended together to create a panoramic view that transcends time and space. Assembled from the hundreds of frames taken of each site, each construction creates a unique vision of a familiar place, one that is wholly recognizable and utterly alien at the same time. “I am an artist who employs the camera as my medium. The pieces are, as much about what photography is not, as they are about what it can be made to do. They’re about the transition of time and movement and an attempt to portray these fundamental elements as experienced…I am exploring the making of objective fantasies or fictional realities. Places that speak of what the camera saw and yet have been composed into personal visions and accentuated experiences, of what I have seen, of what I have felt and want you to feel. 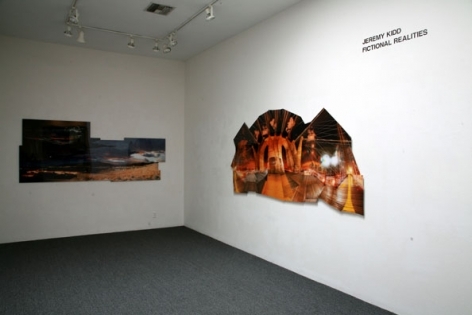 Romanticized environments that are more akin to the way I choose to record and interpret my experiences rather than actual observations” (Jeremy Kidd, Artist Statement). The depth and display of Kidd’s work leaves a lasting impression on viewer, collector, and critic alike. “Jeremy Kidd ascribes to the manifesto of technological triumph, espousing a love of speed, light and pure architectural forms. 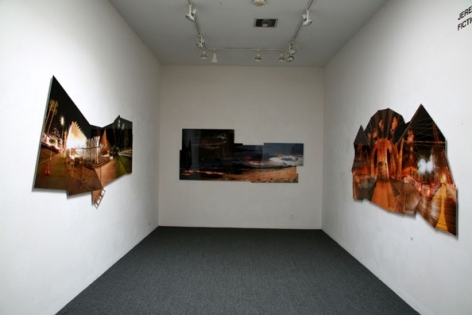 Kidd investigates beauty on a grand scale, displacement and constructivism. 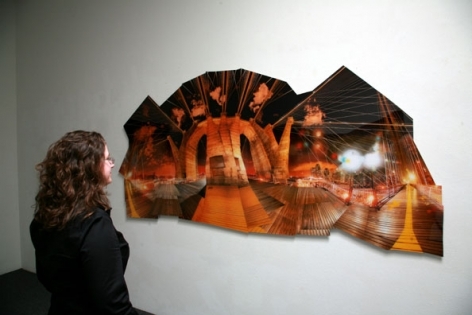 Choosing urban scenes as his subjects, he employees several different elements including time-lapse photography, panoramic vantage points and computerized alterations to cerate a spectacle of light and form. As with the Futurists, Kidd’s images defy imagination on many levels simultaneously, yet retain a close approximation of reality that both confounds and amazes. His “hyper modernist constructions” invite the viewer in while making it all too clear that one would have to defy gravity and the basic laws that govern our universe to realize these worlds as factual and real, yet the seduction is impossible to resist” (Eve Wood, “Hyper Architectural Typologies” Artillery July/August 2008). 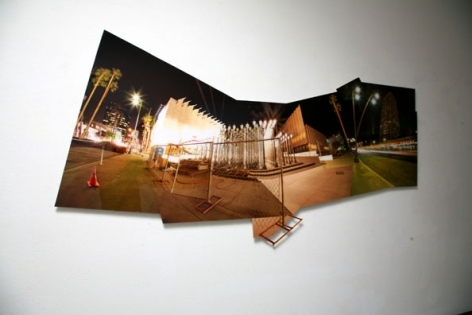 Jeremy Kidd is a British born, Los Angeles based artist and photographer. 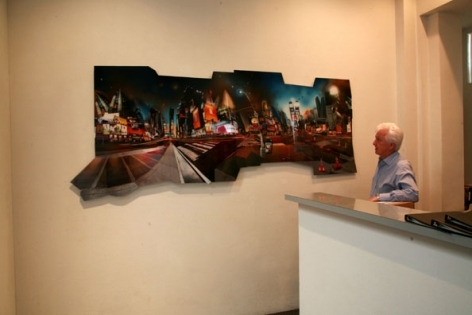 He has taught at California Institute of the Arts , Valencia and the Otis College of Art and Design, Los Angeles. 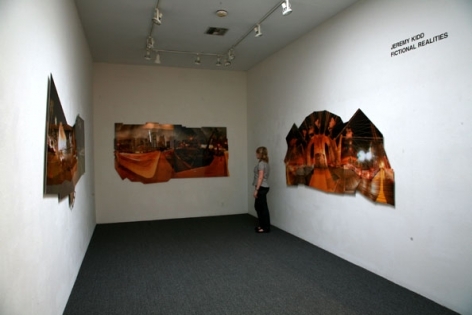 His work has been exhibited at Orange County Museum of Art, The Aldrich Museum of Contemporary Art and has had one-person shows at: Laguna Museum of Art, and UCR California Museum of Photography. 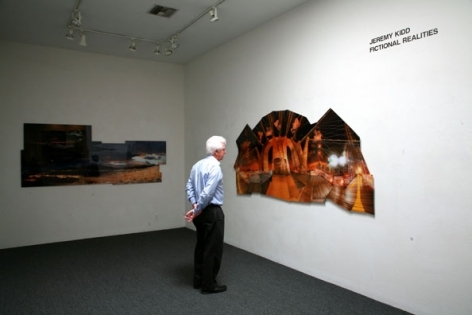 His photographs are included in a number of private, public, and corporate collections including the American Embassies of Algeria and Panama, Nokia, Kaiser Permanente, California State Senate Contemporary Art Collection, and the Orange County Museum of Art.